Language policy implementation is a complex, multilayered process. Understanding this process can be achieved by identifying the agents, layers, and processes of language planning and policy activities, analyzing the layers independently, and examining the relations among the layers. 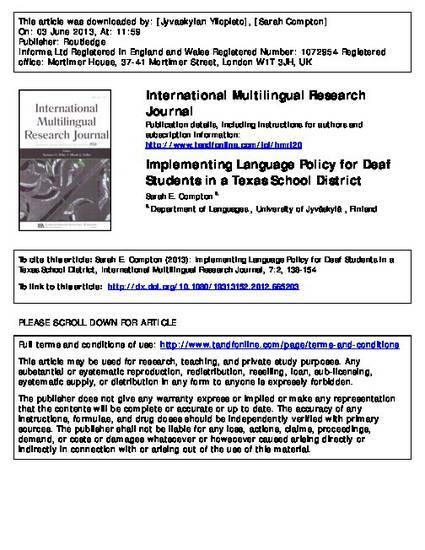 Considering these dimensions, this article explicates how U.S. special education policy functions as de facto language policy for deaf students. Turning to implementation in local contexts, data from a larger multi-sited, qualitative case study of a Texas school district is presented to show how individuals act as policy-implementing agents and how their beliefs about language and education policy influences the policy discourses they take up and the degree to which they open up multilingual, multimodal ideological and implementational spaces within deaf education policies.